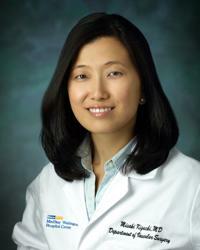 Misaki Kiguchi, MD, is a vascular surgeon with the MedStar Heart and Vascular Institute (MHVI) with office hours in Washington, DC and Chevy Chase, MD. She is a trained specialist in the treatment of both arterial and venous diseases. Her surgical expertise spans the treatment of aortic aneurysms, carotid artery disease, hemodialysis access, peripheral artery disease and venous insufficiency, using the most effective and safest therapies. An expert in cosmetic and non-cosmetic vein treatment, Dr. Kiguchi brings a wealth of experience to her vein practice. She is dedicated to helping patients, who are often dealing with venous insufficiency to dramatically improve their quality of life. Dr. Kiguchi was born in Japan; her family subsequently immigrated to the United States, and she grew up in Austin, Texas. She received her undergraduate degree in molecular biology from Yale University and her medical degree from Yale University School of Medicine. In addition, her interest in health care policy motivated her to concurrently pursue an M.B.A. She completed her internship and surgical residency at the University of Pittsburgh Medical Center, one of the largest and most prestigious vascular training programs in the country. She has published a variety of articles based on her research and serves on several national academic vascular committees. Earlier this year, Dr. Kiguchi partnered with Dr. Edward Yiming Woo to discuss the latest advances in treatments of vascular disease and how minimally invasive technologies can provide better patient outcomes.